ابوطالبی اصفهانی, محسن, رحیمی, امیر مسعود, قاسمی, زهره. (1397). تعیین ظرفیت گردش‌ به‌ چپ در تقاطع‌های چراغ‌دار با استفاده از مدل‌سازی و شبیه‌سازی جریان ترافیک. 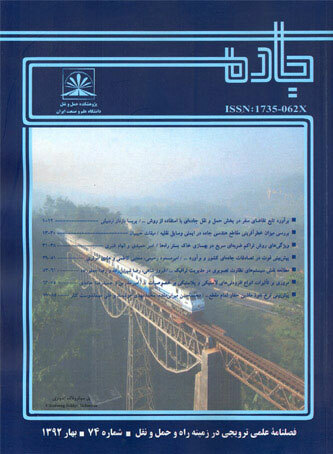 جاده, 26(97), 13-24. محسن ابوطالبی اصفهانی; امیر مسعود رحیمی; زهره قاسمی. "تعیین ظرفیت گردش‌ به‌ چپ در تقاطع‌های چراغ‌دار با استفاده از مدل‌سازی و شبیه‌سازی جریان ترافیک". جاده, 26, 97, 1397, 13-24. ابوطالبی اصفهانی, محسن, رحیمی, امیر مسعود, قاسمی, زهره. (1397). 'تعیین ظرفیت گردش‌ به‌ چپ در تقاطع‌های چراغ‌دار با استفاده از مدل‌سازی و شبیه‌سازی جریان ترافیک', جاده, 26(97), pp. 13-24. ابوطالبی اصفهانی, محسن, رحیمی, امیر مسعود, قاسمی, زهره. تعیین ظرفیت گردش‌ به‌ چپ در تقاطع‌های چراغ‌دار با استفاده از مدل‌سازی و شبیه‌سازی جریان ترافیک. جاده, 1397; 26(97): 13-24. -Agent, K.R., (1979), “An Evaluation of Permissive Left-turn Phasing. Research Report 519”. Kentucky Department of Transportaion, Frankfort, K.
-­Agent, K.R., (1985), "Guidelines for the Use of Protected/Permissive Left-turn Phasing", Report UKTRP-85-19. Kentucky Transportation Center, University of Kentucky, Lexington, KY.
"­Guidelines for the Installation of Left-Turn Phasing", Report KTC-95-23. Knetucky Transportation Research Center, University of Kentucky, Lexington, KY.
-­Al-Kaisy, A. F., & Stewart, J. A., (2001), “New approach for developing warrants of protected left-turn phase atsignalized intersections Transportation Research Part A: Policy and Practice”, 35(6), pp.561-574. “Left-turn phase: Permissive, protected, or both? A quasi-experimental design in New York City”. -Cottrell, B.H. (1985), "Guidelines for Exclusive/Permissive Left-turn Signal Phasing", Research Report VHTRC 85-R19. Virginia Highway & Transportation Research Council, Charlottesville, VA.
-Koonce, P., (2008), “Traffic signal timing manual (No. FHWA-HOP-08-024)”. United States. Federal Highway Administration. - Levinson, H. S. (1989), “Capacity Of Shared Left-Turn Lanes-A Simplified Approach” Transportation Research Record. - Stamatiadis, N., Tate, S., & Kirk, A. (2016), “Left-turn phasing decisions based on conflict analysis”. Transportation Research Procedia, 14, pp.3390-3398. - Transport Research Board. (2010), “Highway Capacity Manual (HCM)”. Washingthon DC. -Yanxi, H., & Xiaoguang, Y. (2013), “Research on the Delay in Signalized Intersection with Left-turn Special Phase”. Procedia-Social and Behavioral Sciences, 96, pp. 2211-2218.